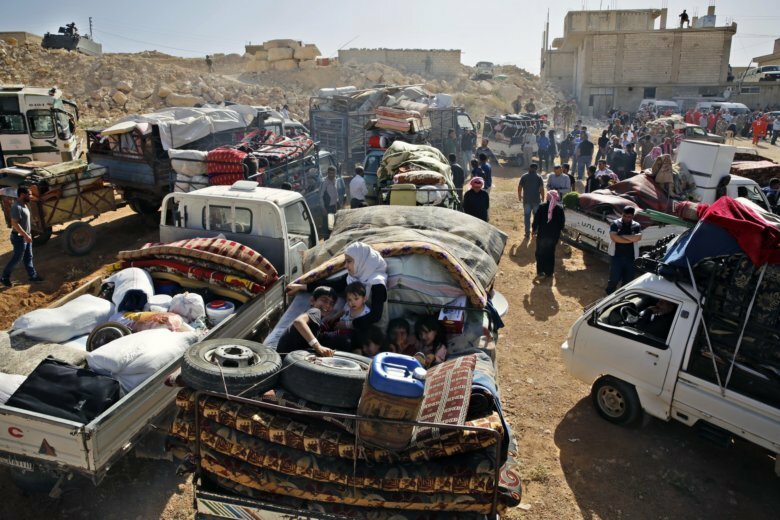 MOSCOW (AP) — The Russian military said nearly 270,000 Syrian refugees have returned home in recent months, a fraction of the estimated 5.6 million Syrians who have fanned out across the world fleeing the seven-year conflict. Moscow and the government in Damascus have been encouraging refugees to repatriate, arguing that the violence has subsided. Russia launched military operations to help Syrian President Bashar Assad in 2015, changing the tide of the war in his favor. Western governments have, however, argued that it’s too early to encourage return. Rights groups and the U.N. fear refugees would face persecution returning to government-controlled areas in the absence of a comprehensive political agreement. Col. Gen. Mikhail Mizintsev of the Russian Defense Ministry told reporters Friday that nearly 6,000 people have returned to Syria in the last week alone, according to data collected by Russia. He said they are seeing large waves of refugees returning home. The conflict has caused nearly half of Syria’s population to be displaced, with an estimated 6 million internally displaced and 5.6 million fleeing to neighboring countries and Europe, and registering with the United Nations Refugee Agency. Russia has negotiated local cease-fires that have greatly reduced the fighting, but the causes of the conflict have not been addressed. The Syrian government has regained control of nearly 60 percent of Syrian territory. But armed opposition, some backed by Turkey, and Islamic State militants remain holed up in areas in the north and south of the country. The violence has not completely stopped. On Friday, the U.N. Children agency UNICEF said the first nine months of 2018 saw the highest number of children killed since the conflict began in 2011, putting it at 870 till September. “These are only verified cases, with actual numbers likely to be much higher,” UNICEF said in a statement Friday. The agency said it is alarmed by recent reports of the killing of up to 30 children in the last IS-held pocket in eastern Syria where the U.S-led coalition and its local allies, the Syrian Democratic Forces, have been waging an offensive for over two months. UNICEF didn’t say how the children were killed, but reports by the Syrian Observatory for Human Rights — the Britain-based group monitoring the war — said more than 30 children were killed last weekend in coalition airstrikes on Shafaa village held by the extremists. The coalition says it checks reports of civilian casualties, describing its airstrikes mostly as targeting IS installations or posts.